Shopping for Avengers Construction Toys? Look out! Justin Hammer is in hot pursuit of Agent Coulson in his flying mech, Detroit Steel! Fly Iron Man to the rescue and take out the mechanized brute with his amazing Power Blasts–but watch out for the chainsaw and six-stud shooter. As they battle it out, switch Agent Coulson's car Lola into flying mode and make a quick escape. 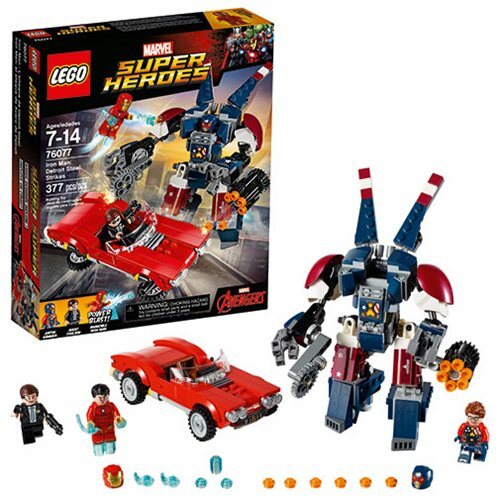 The LEGO Avengers 76077 Iron Man Detroit Steel Strikes includes 377 pieces. Ages 7-14.